A microfiber cleaning tool that truly makes picking up dirt from any surface in your home easier than ever. This mitten takes the cleaning power of microfiber and combines it with the convenience of a glove. Now you can dust and clean with even less effort. This one size fits all glove protects your hands and makes cleaning easy, all at the same time. Avoid leaving behind fingerprints for those professional detail jobs. 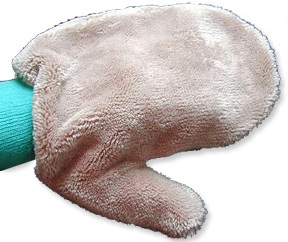 This mitten is great for cleaning around the home or office, but it can also be used for washing and waxing your car too. Just throw it in the wash when you are done because it is 100% reusable and can handle hundreds of washings. Use it wet or dry for dusting, cleaning, buffing and polishing. Works great for washing your car too! Because microfiber is such a revolutionary cleaning material you only need to use water to clean almost anything. Keep your home safe and chemical free without compromising cleanliness. Tiny hooks and loops scrape the surface to collect dirt and then lock it into the fibers. This glove will remove 98-99% off all dirt, dust, grime, germs and bacteria from surfaces with only water as a detergent. You can use your favorite cleaner if you want to, but microfiber cleans so well, you don't have to. Our mitten is made from superior materials and processes. It's quality is unmatched, and makes it uniquely superior for cleaning, dusting, buffing, polishing and more. It features and extended wrist cuff for increased comfort, and is made from the highest quality microfiber available. Avoid finger prints and lint, while keeping dust and grime off your hands. It is wonderful for cleaning hard-to-reach areas. Order Yours Today! Microfiber Cleaning Mitten - Enjoy the benefits of fast and easy cleaning with this amazing mitten. Just slip it on to clean surfaces all over your home or office. Wet or dry. Very nice, but a little large. I turned them inside out and sewed a stitch all around it and cut off the excess material. Works great!